Introducing the ALL-NEW MYDO Luck Shot Trolling. The MYDO Baitswimmer advantages applied to plastic bait trolling for gamefish. The MYDO heads impart a swimming motion to your bait – bringing it life! Tuna and other fast moving gamefish scramble for the MYtDO Luck Shot range, in it’s 4 sizes. 1.7 to 3.5 Ounces. More weight equals more depth! And with a powerful single hook the rig is designed for fishing for live bait and for healthy releases. Regular trolling swimming lures with treble hooks destroy a fish in no time. Eyes, gills, mouth… But the MYDO Luck Shot Trolling lures hook the fish in the corner or top jaw every time – making for quick and pain free hook extraction. More healthy releases. Longer lasting live bait. 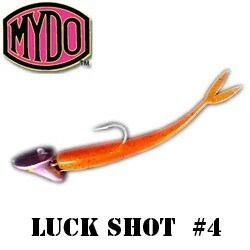 MYDO Luck Shot lures are also great fished on the bottom. Rockcod jump on them. Use as the sinker on your bottom fishing trace. Or just leave it dangling in midwater. The rocking motion of your boat will make it move real life-like. The all new MYDO Luck Shot range features #4 at 3.5 Ounces (100 grams) – for casting and jigging deep waters. 60m or more is no problem, just drop it down! It takes a 4 to 6 inch paddle tail that comes to life when stuck onto the MYDO Luck Shot, an adaptation of the incredibly successful MYDO Bait Swimmer principles, designs and patents. These heavyweights are meant for saltwater deployment and are suitably armed with 7/0 Mustad O’Shaugnessy single hooks. Strong! And the internal wire rigging of the MYDO heads tests out to 60kg’s and still never pulled! Cast the #4 MYDO Luck Shot rigged with a 6 inch or bigger paddletail plastic, into river mouth areas or channels in between the mid break and the shore break. On a ski-boat, just drop the lure to the bottom and jig it around, giving it action and life. Sweeten the offering with a fillet of sardine hanging off the hook! Get down deep using the hydrodynamic shape of the MYDO Luck Shot to take advantage of the current. A slower retrieve works better for yellowtail and Amberjack. Just keep one in the water at all times when fishing for yellowfin! They even catch fish like a trap stick! Cast 100m with the 3.5oz #4, or leave it hanging in the chum slick. And then on your run back up the reef, troll the #4 at high speeds up to 12 knots or more. As in the Daga Salmon deployment above, just get to the bottom and give it some action. Flavouring with a sardine fillet really works too!